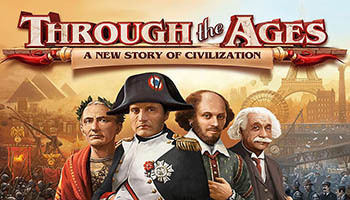 Through the Ages is a civilization building game. 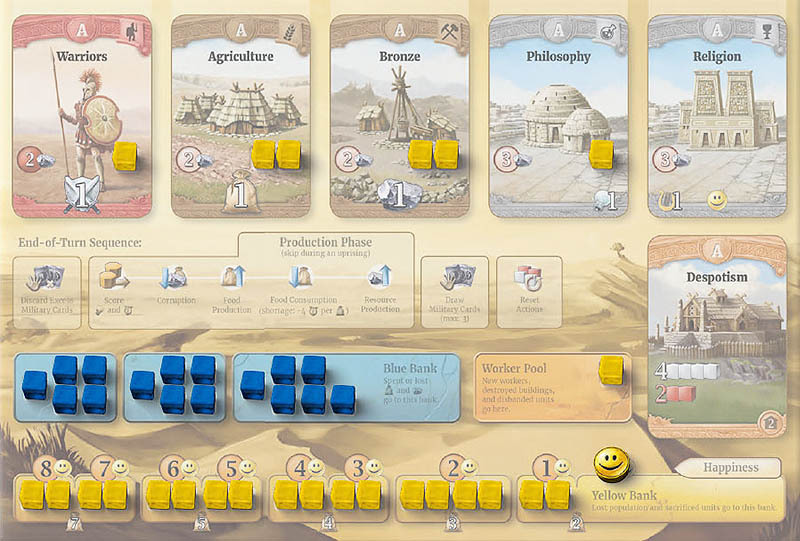 Each player attempts to build the best civilization through careful resource management, discovering new technologies, electing the right leaders, building wonders and maintaining a strong military. Weakness in any area can be exploited by your opponents. The game takes place throughout the ages beginning in the age of antiquity and ending in the modern age. One of the primary mechanisms in TTA is card drafting. Technologies, wonders, and leaders come into play and become easier to draft the longer they are in play. In order to use a technology you will need enough science to discover it, enough food to create a population to man it and enough resources (ore) to build the building to use it. While balancing the resources needed to advance your technology you also need to build a military. Military is built in the same way as civilian buildings. Players that have a weak military will be preyed upon by other players. There is no map in the game so you cannot lose territory, but players with higher military will steal resources, science, kill leaders, take population or culture. It is very difficult to win with a large military, but it is very easy to lose because of a weak one. Get ready to build a civilization that will thrive through the ages. 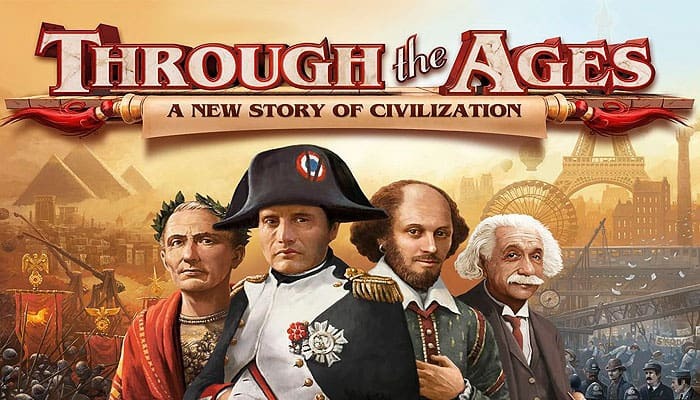 In this game, each player develops a civilization from Antiquity to the present, striving to leave a lasting impression on history. Your civilization scores culture points for its influence on world affairs through literature, drama, religion, wondrous constructions, and great leaders. Put the player board in that color on the table in front of you. Around it, leave plenty of space into which your civilization can grow. Each player takes a set of 7 wooden pieces in his or her color. Before the first game, you may decorate them with the stickers provided. There are two types of cards - civil cards and military cards. 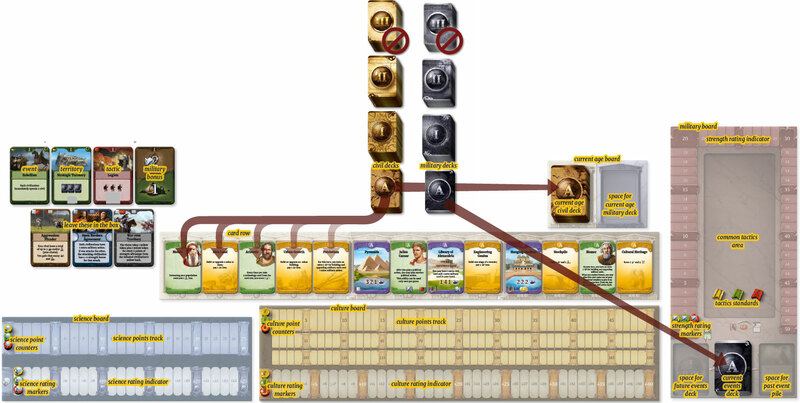 We already know some civil cards: All the initial technologies printed on your player board are Age A civil cards. The military cards will enter the game later. Return both Age III decks to the box. Your first game will have one age less than the full game. In the full game, Age III is a full age like Ages I and II. After resolving the end of Age II, shuffle the Age III civil and military decks and place them on the current age board as the new current age decks. The game continues for another age. When the Age III civil deck runs out, Age II cards in hand are discarded, Age II leaders, unfinished wonders, and pacts are removed from play. Each player loses 2 yellow tokens. Age IV begins. It has no current age decks. If Age IV begins during the first player's turn, it is the last round. Otherwise, the following round is the last round.